Kohl’s: HUGE Savings – Let’s Shop! Let’s go shopping at Kohl’s! 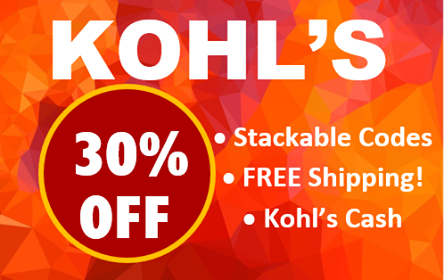 Right now get 30% off your purchase when you pay with your Kohl’s Card. Plus get free shipping! Keep reading down to see other stackable promo codes! TWO PAIRS of Men’s Fila Shoes & Get $10 Kohl’s Cash Back! Simple by Design Bath Wrap $6.99 (reg. $24.99) FREE Shipping! From 12am (CDT) September 13 to 11:59pm (CDT) September 23, everyone gets $10 Kohl’s Cash® for every $50 spent in store, online, at a Kohl’s Kiosk or with the Kohl’s App on all sale-, regular- and clearance-priced merchandise!